BEIJING, China, July 27, 2010 (ENS) – At least 333 people have been killed in rainstorms and floods across China since July 14 while 300 others are still missing, the Ministry of Civil Affairs said Tuesday, and more monsoon rainstorms are on the way. Between now and Thursday, a new round of downpours is expected to hit parts of southern China, with a maximum rainfall of 150 mm (six inches), the China Meteorological Administration forecast. Ships’ passage through the Yangtze River’s Three Gorges Dam was suspended Tuesday for the second time this month as engineers at the dam dealt with another surge of flood waters. This morning continuous heavy rains caused flood flows caused the swollen river to peak at 56,000 cubic meters per second, the second greatest peak flood this year, engineers with the dam told the state news service Xinhua. More than 100 vessels are waiting either side of the dam. Shipping services were first suspended on July 19 for the first peak flow of the year on July 20, when water flow rates reached 70,000 cubic meters per second. That flow rate was more than that of the 1998 floods that killed 4,150 people. It was also the highest flow rate since the dam became fully operational in 2009. The dam reopened to vessel traffic on July 22, two days after the peak flow. Some of the country’s other major rivers are also flowing above their warning levels, including the Jialing River, Hanjiang River and Huaihe River, the Yangtze River Flood Control Office said in a statement. The water flow into the Danjiangkou Reservoir from the Hanjiang River, a tributary of the Yangtze River, in the northern part of Hubei province, peaked at a rate of 34,100 cubic meters per second on Sunday, the highest in almost three decades, according to local disaster relief officials. 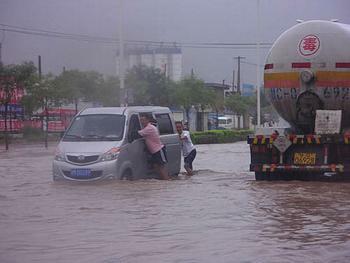 Chinese officials evacuated more than 100,000 people as the river burst its banks. Near Wuhan, the capital city of central China’s Hubei Province, the continuous rains had doubled the water area of Danjiangkou Reservoir and increased the Hanjiang River’s width by 10 percent, said an official of the Wuhan climate center of the Hubei Meteorology Bureau on Tuesday. The water area of the reservoir reached 611.6 square kilometers, up 55.4 percent from July’s previous greatest area of 393.6 square kilometers, the official said. The Danjiangkou Reservoir this week began to reduce its water discharge rate to lessen the impact of the flood downstream, said an official of the Danjiangkou Water Resources Administration. Water levels on the Hanjiang River have been above the danger level for seven days, said an official in the hydrology bureau of the Changjiang Water Resources Commission. One of the largest reservoirs in Asia, the Danjiangkou Reservoir buffered the Yangtze floods which peaked July 19, when the water flow rate reached 27,500 cubic meter per second, said Liu Song, deputy director of the reservoir dispatch center of Hanjiang River Corporation. The reservoir reduced the burden on the Three Gorges Dam, Liu said. “Without the Danjiangkou Reservoir, the situation would be much more severe and the flood would have caused many more losses,” he said. China has been dealing with severe flooding this year, with at least 1,250 people killed or missing. The latest statistics released Monday by the Office of Flood Control and Drought Relief Headquarters show floods in China this year have left 823 people dead and 437 missing, with economic losses of 154 billion yuan (US$22.6 billion).